A wonderful serenity has taken possession of my entire soul, like these sweet mornings of spring that I enjoy with my whole heart. Tony Cedras’ latest album marks a significant milestone in his career and, indeed, his life. It highlights his journey back home to where it all began in Cape Town, South Africa, especially Elsie’s River where he grew up. Having been away for almost three decades touring the world and eventually settling down in New York, he returned back home in 2013. Love Letter to Cape Town pays tribute to Tony’s ancestral soil and heritage and brings him back to the roots of native South African music and language. Most of the material was recorded in Cape Town at Milestones Studios where a large majority of Cape Town’s legendary musicians, like Abdullah Ibrahim and Winston Mankunku, recorded their songs. The album also includes a US contingent of musicians who recorded in New York. The mixing was done in Cape Town and New York at Acappella Pictures. The core band includes Errol Dyers [guitar], Jack Momple [drums], Wesley Rustin [double bass] and Tony Cedras [piano, accordion, guitar, trumpet and vocals]. Errol Dyers, born in Cape Town, is a long-time friend and fellow musician of Tony and most certainly a recognizable contributor to the original music scene in Cape Town. Jack Momple, born in Durban, later settled in Cape Town and co-founded a household local band named Pacific Express together with Tony. They formed a longstanding musical friendship. Wesley Rustin, one of the younger generation, is a sought-after session double bass player whom Tony came to know during the recording of Love Letter to Cape Town. Darren English [trumpet], a talented young musician who is establishing himself as a noteworthy musician in the USA, thereby setting a high standard for the younger musicians in South Africa. Mark Fransman [soprano, alto and baritone saxophone and alto flute] is an energetic and talented musician from Cape Town [//Hui !Gaeb]. Marcus Rojas [tuba] is affiliated with the New York Symphony Orchestra and the SCO (American Composers Orchestra) and also worked together with Tony on the Henry Threadgill projects. Charlie Burnham [violin]. Tony is associated with this dear musician and friend through Cassandra Wilson and Henry Threadgill. Jeff Haynes [percussion]. Tony’s affiliation with this wonderful musician is through Cassandra Wilson, Samite Mulondo and Pat Matheny Group. Immerse yourself in the musical world of Tony Cedras and get a glimpse behind the scenes of your favourite album. Watch all music clips of Tony Cedras on YouTube. Lose yourself in the sound of Tony Cedras. Listen to the songs on SoundCloud. Buy full album version on iTunes and all major online music stores. A beautiful narrative highlighting Tony’s deeply rooted admiration and respect for the Khoisan, talking about his musical journey beyond the borders of South Africa while remaining true to himself and his music. © Institute for the Restoration of the Aborigine of South Africa (IRASA). 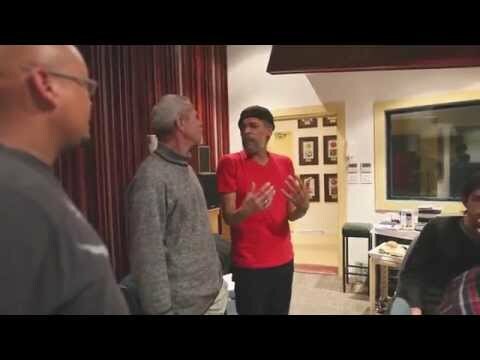 Feel the vibes of the recording sessions for Love Letter To Cape Town as you view the images of Tony’s musical journey. BORN in Elsie’s River, Cape Town, South Africa, in 1952, Tony Cedras is a sought-after, highly respected multi-instrumentalist who has toured and recorded throughout the world as a longstanding member of Paul Simon’s band as well as with Hugh Masekela, Miriam Makeba, Joan Baez, Harry Belafonte, Ziggy Marley, Henry Threadgill, Milton Nascimento, Ladysmith Black Mambazo, Cassandra Wilson, Gigi and Jonathan Butler. Before joining Paul Simon during his Graceland tour, Tony Cedras travelled throughout the world performing as an anti-Apartheid cultural ambassador for “Nelson Mandela’s People” in the Amandla Cultural Ensemble in exile. Tony Cedras’ musical journey beyond the borders of South Africa has always been a symbol of hope to many aspiring and legendary musicians. He understands and deploys the power of music to unite and rally people to feel something deeply, and to take action. Tony is an exceptional, creative performer and synthesizes cultural traditions and musical genres through his approach to accordion, harmonium, trumpet, keyboard and guitar. Irrespective of countless international accolades, he has kept his feet on the ground and always stayed true to himself and his music. After living in Brooklyn, New York, where he regularly performed with fellow expatriates such as bassist Bakithi Kumalo and saxophonist Morris Goldberg, Tony moved back to South Africa in 2013. He then intensified his support for a cause deeply anchored in his heart: the preservation and recognition of the Aboriginal Khoisan peoples of Southern Africa, to raise awareness of Aboriginal Khoisan heritage and culture. Tony highlights his admiration and respect for his ancestral soil and heritage beautifully in his latest album Love Letters to Cape Town, which was recorded in Cape Town at Milestone studios.